During our road trip we stopped at Warwick Castle. Originally a fortress castle, Warwick was later converted to a country home in the 17th century. 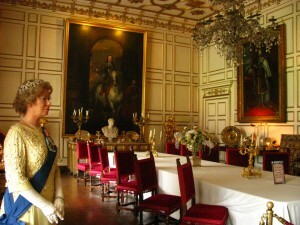 The state rooms are currently set up with wax figures depicting a house party in which an important earl was visiting. It sounds super corny, but it was highly entertaining! There was an audio track running in each room so as you toured the castle you listened to these important duchesses discussing their innermost secrets about their crushes, affairs, and illegitimate children with the maids who were helping them get ready. It was astonishing to realize their conversations outlined scandals that actually took place. 1. When spoken to, stand still, keep your hands quiet, and always look at the person speaking. 2. Never let your voice be heard by the ladies and gentleman of the household. If they have spoken directly to you with a question or statement which requires a response, speak as little as possible. 3. Items that have been dropped, such as spectacles or handkerchiefs, and other small items, should be returned to their owners on a salver. 4. Never offer your opinion to your employer. 5. Always “give room”: that is, if you encounter one of your betters in the house or on the stairs, you are to make yourself as invisible as possible, turning yourself toward the wall and adverting your eyes. 6. Except in reply to a salutation offered, never say “good morning” or “good night” to your employer. 7. If you are required to walk with a lady or gentleman in order to carry packages, or any other reason, always keep 3 paces back. So many principles of behavior to keep in mind! I can’t imagine what it must have been like to constantly be submitting to superiors. What a loss of dignity. Written by: recklesswonder on September 8, 2011.on November 13, 2011.